"Gaia initial QSO catalogue : The variability and compactness indexes", A.H. Andrei, S. Anton, C. Barache, S. Bouquillon, G. Bourda, J.-F. Le Campion, P. Charlot, S. Lambert, J.J. Pereira Osorio, J. Souchay, et al. "r-process abundances in the EMP star CS 31082-001 using STIS/HST", C. Siqueira-Mello Jr., M. Spite, B. Barbuy, F. Spite, E. Caffau, V. Hill, S. Wanajo, F. Primas, B. Plez, R. Cayrel, et al. "Temporal variations in the evaporating atmosphere of the exoplanet HD 189733b", V. Bourrier, A. Lecavelier des Etangs, P. J. Wheatley, H. Dupuy, D. Ehrenreich, A. Vidal-Madjar, G. Hébrard, G. E. Ballester, J.-M. Désert, R. Ferlet, et al. "Stars with the B[e] phenomenon seen by long baseline interferometry", M. Borges Fernandes, O. Chesneau, M. Kraus, L. Cidale, A. Meilland, P. Bendjoya, A. Domiciano de Souza, G. Niccolini, I. Andruchow, S. Kanaan, et al. "Laboratory experiments of radiative shocks in the context of stellar accretion. 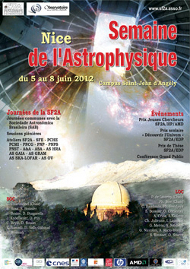 ", U. Chaulagain, C. Stehlé, L. de Sá, J. Larour, P. Auvray, M. Kozlova, M. Krus, J. Dostal, J. Propupek, F. Suzuki-Vidal, et al. "Spectral characterisation of the CARMENES input catalogue", A. Klutsch, F. J. Alonso-Floriano, J. A. Caballero, D. Montes, M. Cortés-Contreras, J. López-Santiago, J. C. Morales, A. Quirrenbach, P. J. Amado, I. Ribas, et al. "Rotational velocity distribution of A stars : Searching for intrinsic slowly rotating normal A0-A1 stars", F. Royer, M. Gebran, R. Monier, Y. Caraty, T. Kiliçoglu, O. Pintado, S. Adelman, B. Smalley, A. Reiners, G. Hill, et al. "Optical Galaxy redshift surveys", L. Sodré Jr.
"Reduction and analysis of MUSE data", J. Richard, R. Bacon, P. M. Weilbacher, O. Streicher, L. Wisotzki, E. C. Herenz, E. Slezak, M. Petremand, A. Jalobeanu, C. Collet, et al. "VHE gamma-ray astronomy in India : Status of HIGRO and participation in CTA", R. J. Britto, B. S. Acharya, J. M. Ahire, G. C. Anupama, N. Bhatt, P. Bhattacharjee, S. Bhattacharyya, V. R. Chitnis, R. Cowsik, N. Dorji, et al. "The electromagnetic calorimeter of the AMS-02 experiment", M. Vecchi, L. Basara, G. Bigongiari, F. Cervelli, G. Chen, G. M. Chen, H. S. Chen, G. Coignet, S. Di Falco, S. Elles, et al. "The accretion disc, jets and environment of the intermediate mass black hole candidate ESO 243-49 HLX-1", N.A. Webb, D. Barret, V. Braito, S. Corbel, D. Cseh, S. A. Farrell, R.P. Fender, N. Gehrels, O. Godet, I. Heywood, et al. "Connecting classrooms to the Milky Way", P. Salomé, A. Radiguet, B. Albert, M. Batrung, M. Caillat, M. Gheudin, Y. Libert, R. Ferlet, A. Maestrini, A.-L. Melchior, et al. "Tools for teaching radio-astronomy", P. Salomé, A. Radiguet, B. Albert, M. Batrung, M. Caillat, M. Gheudin, Y. Libert, R. Ferlet, A. Maestrini, A.-L. Melchior, et al. "First LOFAR results on galaxy clusters", C. Ferrari, I. van Bemmel, A. Bonafede, L. Bîrzan, M. Brüggen, G. Brunetti, R. Cassano, J. Conway, F. De Gasperin, G. Heald, et al.